Are you new to Trustpilot? Or just want to know more about how things work? Use this guide to learn more about how to start reading and writing reviews! 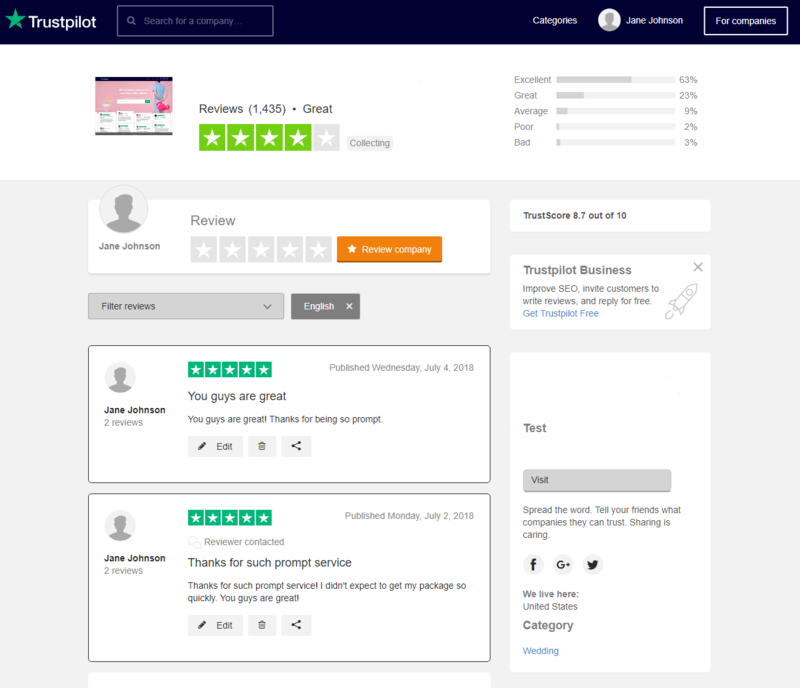 Trustpilot is an online review community where you can read and write genuine, unfiltered reviews about companies whose products or services you're interested in – and review companies whose products or services you've bought or used. We want reviewers to share their experiences with each other and businesses. Businesses can then respond to and use that feedback to provide better service. Trustpilot provides the community where everyone can get together to improve experiences everywhere. We want to keep the Trustpilot platform open and transparent to everyone, so you need to have a profile in order to write a review. Trust and transparency are essential to us at Trustpilot, so we want to make sure that every review is connected to a real person who's had a real buying or service experience. This helps us make sure that the reviews you read on Trustpilot are genuine. Your profile also gives us a way to let you know when companies respond to a review or want to contact you to resolve an issue. You can also get a profile when you make a purchase or have a service experience with a company. Some companies may invite you to review their company. When you receive their review invitation email, click on the invitation link. This automatically creates your profile based on your name and the email address you gave them when you placed your order. We'll send you a welcome email that contains your account information. Now that you've got your account, it's time to log in to the Trustpilot platform. On the Trustpilot website, in the upper-right corner of the screen, select Log in. On the login page, log in with your Facebook, Google, or email account. If you've signed up with your email, enter your email address and Trustpilot password, then click Log in. If you've signed up with Facebook or Google, in the login window, select your account. Great! Now you can write reviews or customize your account in My Settings. After you've signed in to Trustpilot, you can customize your profile and maintain your account in My Settings. On the home page, point to your name, and then select My Settings from the menu. Update your personal settings, including your profile picture, name, language, location, and gender. Set your email preferences and unsubscribe from certain types of messages. Link your account to your social media profiles. View and download your account data. Note: To change the email address that's associated with your account, contact our Support Team. How do I find a company's Trustpilot page? It's time to start exploring Trustpilot and reading reviews to find out what other people have to say about their service experiences. On the Trustpilot homepage, in the Search for a company box, enter the company's name or website. Select the company's name from the drop-down menu. You can also select the Search button or select enter to go to the search results page, then select the company from the results list to go to their company page. Note: Check the website’s URL, domain name, and company name to make sure you've found the right company. The company's profile page contains a lot of useful information. You can quickly see their star rating and TrustScore, information about the company and, most importantly, their reviews. The most recent reviews appear first. Tip: Want reviews in a specific language? Curious to see how a company responds to one-star reviews? Select Filter reviews to filter reviews by language or star rating. How do I write reviews? You've signed up. You've logged in. You've read reviews. You've had an experience. You've got an opinion. Share your experience with the world and write your first review. On the company profile page, select the Review company button. In the Your review box, write your review. In the Title of your review field, enter a title. If you're asked to do so, you can add the reference, booking or tracking number that corresponds to your buying or service experience. Select the Post your review now button. You can also write a review for a company before you've created an account, but you'll need to register before the review gets published. Congratulations! Your review helps guide other people towards better buying experiences and gives companies feedback they can use to provide better service to everyone. Help! Where did my review go? Sometimes, reviews temporarily get taken down from Trustpilot for investigation. But they haven't completely disappeared into thin air! A review might have been flagged by our fraud detection software, or it may not have followed our User Guidelines. If you think this has happened by mistake, get in touch with our Compliance team. Why do companies report reviews? To keep the Trustpilot platform open and transparent, it's important that reviews follow Trustpilot's User Guidelines. All reviews have to be from real people about genuine service experiences. Companies report reviews if they believe that the review goes against our guidelines. Thanks for reading this guide. Keep browsing the Support Center to learn more about the ins and outs of Trustpilot. Now, go out there and share your experiences with the world!